This article is about the king of the Kingdom of Judah. For the king of the Kingdom of Israel, see Ahaziah of Israel. 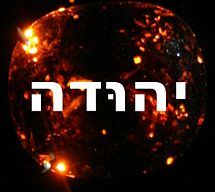 King Ahaziah (Hebrew: אחזיה, ʼAkhazyāh; "Name means::YHWH holds") (908 BC-vr. 887 BC-r. 886 BC-d. 886 BC according to Ussher, or 863-vr. 842-r. 841-d. 841 BC according to Thiele) was the sixth king of the Kingdom of Judah. (2_Chronicles 22:1-10 ) He succeeded his father Jehoram and in fact served a year as pro-rex under Jehoram before his one-year lone reign. He is remembered very little, and mainly on account of King Jehu, who killed him and his uncle Jehoram of Israel in the same engagement, and his mother Athaliah, who counseled him to do evil deeds and ultimately served a bloody reign of her own. He was the youngest of Jehoram's sons by Athaliah, and also had a sister named Jehosheba. Through his mother, the rulers of the House of Omri were in fact his uncles to three different degrees. The Chronicler and the author of 1 and 2 Kings give two widely different ages for him: the Chronicler says that he was 42 when he began to reign (2_Chronicles 22:2 ) while the author of the Kings books says that he was 22. (2_Kings 8:26 ) Ussher accepted the younger age, and Larry Pierce holds that the greater age is most likely a handwriting mistake by an unnamed scribe—one of the very few mistakes to be found in Bible manuscripts, and a subject of much controversy. Jones resolves the problem by observing that the Hebrew does not literally say that Ahaziah was forty-two years old, but rather that he was "a son of forty-two years." The forty-two years refers to the length of time that the House of Omri had been ruling in Israel when Ahaziah became pro-rex in Judah. Ahaziah married Zibia of Beersheba, probably in the year that his father made him viceroy. By her he had a son named Joash in the year of his lone reign. In the last year of his reign, Ahaziah's father Jehoram made him viceroy while suffering from a gastrointestinal disease. (2_Kings 9:29 ) A year later, Jehoram died and Ahaziah succeeded him. His brief reign is remarkable only for his remaining under the influence of his mother Athaliah, who had introduced Baalism to the Kingdom of Judah and continued to promote it. The synchronies between the two kingdoms indicate that Ahaziah used non-accession reckoning, and therefore he reigned for less than one year, and died in the very year that he became sole rex. Soon afterward, Jehu appeared at the head of a company. Jehoram and Ahaziah prepared their chariots and rode out to meet Jehu. Jehu essentially declared war. Jehoram turned and fled, and said to Ahaziah that they had been tricked. Nor did Jehoram live long, because Jehu killed him with an arrow shot to the back. In any event, Ahaziah's mother Athaliah took over the throne and began a six-year reign marred by much bloodshed. ↑ 2.0 2.1 Jones, Floyd N., The Chronology of the Old Testament, Green Forest, AR: Master Books, 2003, Chart 5. ↑ 4.0 4.1 4.2 4.3 4.4 Konig, George. Ahaziah. AboutBibleProphecy.com, 2007. Retrieved June 15, 2007. ↑ 5.0 5.1 5.2 Authors unknown. "Entry for Ahaziah." The Columbia Electronic Encyclopedia, 6th ed. Columbia University Press, 2007. Retrieved June 15, 2007. ↑ 6.0 6.1 6.2 Authors unknown. "Entry for Ahaziah." WebBible Encyclopedia. Retrieved June 15, 2007. ↑ Pierce, Larry. "Ussher's Time Line for the Divided Kingdom." Trinity Review, 170, April 1999. Retrieved June 4, 2007, from Answers in Genesis. Requires PDF reader or plug-in. This page was last modified on 17 April 2017, at 02:26.